Derived from the larger flagship Trident 88 consoles, this new range offers many of the same features for a lot less money. The Trident brand dates back to the early 1970s and a very influential London recording studio that set up a console manufacturing business. Although the studio and console businesses went their own separate ways, Trident Audio Developments still make products that draw upon that heritage. Currently, Trident offer two hardware channel strips, a 500-series EQ module and the 10-slot Deca-Dent rack and power supply, as well as their flagship product, the Trident 88 large-format analogue console. 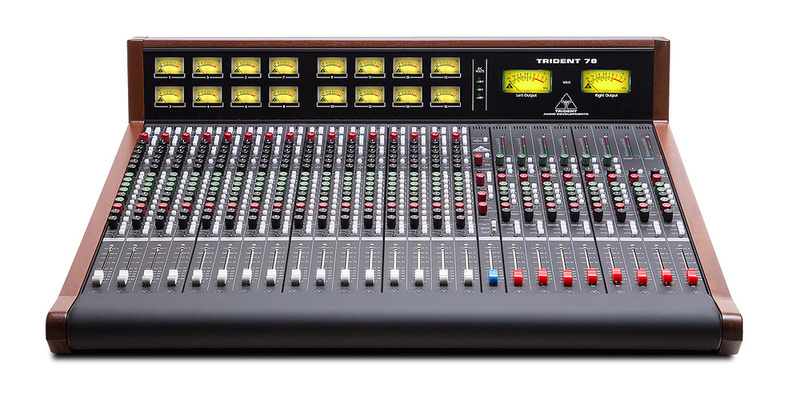 The subject of this review is a new, more affordable version of that console — the Trident 78. Like its upmarket sibling, it was designed by Taz Bhogal, whose experience dates back to the development of the original Trident Series 80C from 1986. It retains the same core design philosophy and signal path ideas as the 88; the keener price is possible thanks to some logical feature-set simplifications and a more cost-effective semi-modular construction. The Trident 78 is available with eight (as on the review model), 16 (as in the main picture), 24 or 32 input channels, and all have the option of moving-coil VU or more affordable LED bar-graph metering in the meter-bridge. Following the traditional in-line concept, each mono channel strip accommodates two signal paths (channel and monitor), and it features six aux sends (four mono, one stereo), a four-band EQ derived from the Trident 80B console, a balanced pre-fade insert and a configurable balanced direct output. 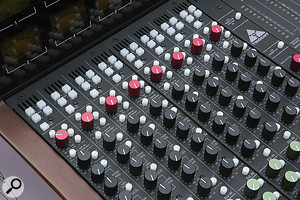 Being an in-line console, the monitor path can borrow the entire equaliser section and the stereo aux send, if desired, and it routes into the stereo mix bus via a rotary fader and pan-pot. The channel path can also be routed into the stereo mix bus and/or any of eight mono sub-groups (in pairs), via a large fader and pan-pot. For mixdowns, the channel line and monitor input connections can be swapped over at the press of a button, allowing the monitor signal to be routed through the full channel path, but the channel and monitor faders can’t be flipped over (as they can on most in-line desks). 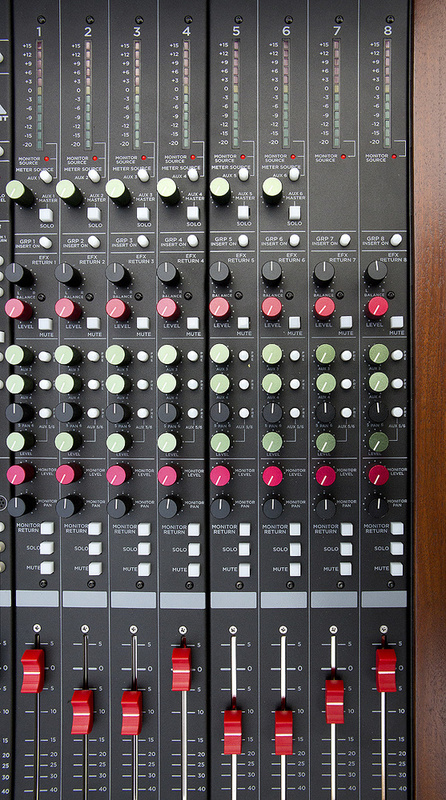 The console always features eight mono sub-groups but these can be used as monitor returns if preferred, effectively working the console in the traditional split format. Each sub-group is equipped with balanced pre-fader inserts and can access two mono and the stereo aux sends. They also feature balanced outputs, post-fade metering, and a long fader, but not EQ. By default, the (post-fade) sub-group output is routed to the stereo mix bus via a separate rotary ‘monitor’ fader and pan-pot, but each group module also has its own monitor input connection, which can be selected to replace the post-fade sub-group signal, if required. Each sub-group also accommodates a stereo effects return which feeds directly into the stereo mix bus, and the first six sub-groups also carry the corresponding auxiliary master controls. A master module houses the master stereo mix fader and simple control-room monitoring and talkback sections. There’s also a pair of external two-track returns, and both main and alt monitoring outputs for two sets of stereo speakers, with talkback to the groups and auxes. Whereas the Trident 88 series consoles are built from individual channel strips, with each fader housed in a separate module, the new Trident 78 models are of ‘semi-modular’ construction: each physical module carries four input or four sub-group channels including their faders. The simplified metalwork brings down the construction costs, obviously, but, importantly, it doesn’t adversely affect the operational ergonomics or make maintenance problematic or inconvenient. In fact, the (largely surface-mount, but in critical places through-hole) electronics for each channel are built on independent, vertically-mounted, circuit boards suspended below each module’s panel in the traditional way. Not only does this simplify servicing, but it ensures excellent crosstalk performance between adjacent channels. It also makes everything a little more reachable: the modules are about 14cm (almost six inches) shorter than those of the Trident 88, and the top of the meter-bridge is about 3cm (an inch) lower. The inputs are all transformerless balanced types, while the main stereo, sub-group, aux master, and primary monitor outputs are active and symmetrically balanced. Impedance-balanced outputs are used for the channel direct outs, inserts sends, and the alt monitor outputs. Like its sibling, the Trident 78 can optionally be fitted with Lundahl transformers on the stereo mix outputs. (At the time of writing, the manual and schematics referred to the optional transformers being on the main monitor output. I’m told that this and a number of other errors in the schematics and documentation should have been corrected by the time you read this.) I gather that the next production run of the master/monitor boards will be modified so that the output monitoring is taken post the transformer outputs (where fitted), so that the effect of overdriving them can be auditioned... which seems like such an obvious requirement that I’m surprised it wasn’t already arranged that way. Other production changes are being made to the input modules (see below), and taken overall I’m left with the impression that this console is, to some extent, a work-in-progress. Power comes from a 2U rackmount switch-mode supply, which accepts 100-240 Volts AC. Terminals are provided to access and link the chassis and audio grounds, and a seven-pin Hirose connector carries the ±18V and +48V DC power rails to the console via a chunky cable. The PSU is cooled by a fan, which is a quiet one, though some might prefer to locate it in a separate machine room. The manufacturers clearly have confidence in their product: a two-year warranty is included (three years if the console is registered within 30 days of purchase). Having outlined the console structure already, I’ll now highlight some of the more interesting features. For anyone unfamiliar with the in-line concept, the monitor signal path in each channel strip was originally intended to handle the output from the corresponding multitrack tape-recorder channel, so a rough mix could be built up across the console on the channels that weren’t being used for recording. Today, those monitor inputs are more likely to come from a DAW/audio interface. The channel path is used to feed the recording signal to the corresponding track of the recorder, via the channel’s direct out. For mixing, the monitor inputs can be flipped across to the channel paths and routed through to the stereo mix bus via the big faders, and with full access to the aux sends. When tracking, the traditional ‘analogue’ practice was to record the processed signal after EQ, outboard dynamics and fader-riding (helping to overcome the limited dynamic range of the recorder). Today, though, it’s common to record a clean input signal to the DAW, and process this later, either inside the DAW or via the console and/or outboard. The channel strips include bypass buttons for both the EQ section and the insert return. The Trident 78 provides some configuration options for the channel direct output, though I feel they could still be improved upon. On the first consoles, jumper links on each input PCB provided post-fade and insert-return options, but both being post-EQ and post-insert (the channel insert point is fixed post-EQ here, whereas it is switchable pre/post EQ in the Trident 88), neither guaranteed a completely clean recorded signal (at least, not without engaging the EQ bypass, which makes it impossible to track clean while building a console mix). I’m told that all subsequent production runs of the Trident 78 (and 88) will offer a third option, which is a pre-fade feed. However, as the insert return connects directly to the fader via the insert switch, in all practical situations I can imagine, these two options are essentially identical. It appears that the insert-return option is borrowed directly from the Trident 88, where it makes sense, since that console’s unbalanced insert socket has normalled send and return connections (so its insert return is effectively a pre-fade/post-EQ direct output, which always provides a signal of some kind and complements the post-fade option in an obvious way). The D-sub in the Trident 78 precludes automatic normalling across the console’s insert send/return connections, though. So if the insert switch is engaged (via the dedicated switch in the EQ section) but there’s no device patched in to the return, the insert-return option will provide no signal. That could be confusing in the heat of a session, so you’ll either want to get used to using the insert switches, or to connect the desk up to a normalled patchbay (I’m told that some manufacturers also make D-sub cables for this purpose). I’d much rather see the third direct-out option being immediately post-preamp; this would always allow a clean signal to flow to the DAW/recorder, while starting to build the analogue mix. Moving on to the mic preamp, this is identical to the Trident 88’s, although it lacks the input transformer option. It’s a discrete-transistor Class-A design boasting low noise, low distortion, a wide bandwidth (>100kHz), and an enormous headroom margin. The gain range spans +5 to +60 dB in mic mode (-20 to +35 dB in line mode) and a maximum of +17dBu can be accepted at the mic input, or +42dBu at the line input. The EIN figure is better than 128.5dBu (20Hz-20kHz, 150Ω source, 60dB gain) — that’s within a decibel or two of theoretical perfection! Illuminated buttons on each channel engage phantom power, invert signal polarity, and select the line input. The 88 model’s separate line gain control has been omitted; instead the output from the dedicated balanced line-receiver amp is padded down and routed through the mic preamp. This saves the expense of a second variable gain stage and rotary control, as well as panel real-estate, but it doesn’t compromised the signal quality — the 78 and 88’s line input’s tech specs are virtually indistinguishable. Another button selects what’s displayed on the channel’s meter: the signal at the direct output (to monitor what’s sent to the recorder/DAW), or the monitor return signal (pre-fade). Another button labelled ‘I/P Rev’ swaps the line and monitor input connections, so that the monitor signal is available to the channel path and its long fader and aux sends for mixing, and the line input flows through the monitor path if extra mix inputs are needed. The four-band EQ is slightly simplified compared with the Trident 88. All four bands enjoy ±15dB boost/cut ranges but, instead of fully tunable high and low shelves, there are two selectable turnover frequencies (8/12 kHz and 60/120 Hz, respectively). The two mid bands are sweepable between 1-15 kHz and 100-1500 Hz, but the Q is fixed. There’s also a switchable 50Hz, 18dB/octave high-pass filter, and a button switches the entire EQ in or out. The whole EQ section can also be switched into the monitor path, if desired. I’ve discussed the inserts already, but the two consoles’ auxes differ slightly too: the Trident 88 has eight auxes (four mono and two stereo), whereas the new console has six, arranged as four mono and one stereo. That’s a sensible place to make savings, as there are more than enough auxes for most applications, and all are switchable pre/post-fade. The stereo aux (5/6) is also movable into the monitor path, if required, as it’s intended to serve as an artist cue mix. The monitor path feeds the stereo mix bus via a rotary fader and pan pot, and has a dedicated mute button but no PFL/AFL facility (unlike the Trident 88). The channel mute kills all post-fade sends: the stereo mix, sub-groups, direct out (if so configured), and post-fade auxes. A pair of LEDs above the fader indicates signal levels at -20dBu (green) and +10dBu (red), with an internal jumper to meter either the pre- or post-fade signal. Unlike on many multitrack desks, there’s no destructive solo mode, but a button on each channel selects whether solo is PFL or (post-pan) stereo AFL (there’s no global PFL/AFL mode switching). The top of each sub-group module carries a long bar-graph meter which can be switched to show the sub-group output, group monitor return (pre-fade) or the corresponding aux master send. These LED meters are in the sub-group modules because the space above in the meter-bridge is occupied by a pair of large VU meters for the main stereo output/monitor signals and PSU status LEDs. Aux send master controls sit below the bar-graphs with a rotary output level knob, AFL solo, and a button to send the post-fade aux output to the corresponding sub-group’s meter. Moving down the strip, the next section controls a stereo effects return (which routes directly to the stereo mix bus), with level, balance, and mute controls. On the Trident 88, the eight stereo effects return inputs are relatively well equipped, each feeding directly into the stereo mix via rotary level and pan/balance controls. They also have a basic tilt EQ, mute and solo buttons and, importantly, the ability to send the effects signal to the stereo aux 7/8 artist cue bus, which is switchable pre/post-fade and has a balance control. The Trident 78 loses several of these facilities (presumably to save costs), but its effects inputs are balanced, which the 88’s currently aren’t. The channel and group strips (the groups are pictured here) are semi-modular. Each module hosts four channels, but beneath the panel there’s a separate card for each channel/group, which should make repair and maintenance fairly efficient, while reducing manufacturing costs significantly.Here, the stereo effects returns still feed the stereo mix bus, via a rotary level control and pan/balance control with a mute button, exactly as before. But the tilt EQ has gone (fair enough), as has the solo button (so you can’t quickly check the EFX signal, which is a shame but no deal breaker). Critically, though, access to the artist cue bus (stereo aux bus 5/6 in the Trident 78) has been lost; the aux controls seen on the group modules are only accessible from the group/monitor path. So if you want to route effects into the artist cue mix (for a ‘comfort reverb’, say) you can’t use the effects returns. Instead, you’d have to patch the effects signals into some spare input channels and access the aux busses from there, or (possibly a more practical solution in many cases) use the group module’s monitor inputs for the EFX returns. In this way, the re-patched return signals still route directly to the stereo mix bus via the monitor level and pan controls, but they also gain an AFL button and pre/post access to mono auxes 3 and 4 and the stereo aux 5/6. The group monitor inputs are mono, so eight groups could handle only four stereo returns, but that shouldn’t be a problem for comfort reverb, or for the few occasions where you want to route one effect output on to another effect send (something else that can’t be done directly from the dedicated returns). As I mentioned earlier, the sub-group signal has its own balanced pre-fade insert, although the switch to activate the return is strangely hidden away between the aux master and effects-return sections. Again, there’s no EQ here, but the sub-group can access aux sends 3-6 (two mono auxes and the stereo one) for effects and artist headphone mixes, with the sends derived pre or post the monitor level control. The group output is controlled by a long, red fader and this feeds the stereo mix bus via a rotary level control labelled ‘Monitor’, and a pan-pot. There’s also a mute button and AFL monitoring, and a button to replace the sub-group signal, at the point it reaches the Monitor level control, with that from a separate external monitor line input. The post-fade sub-group signal always remains available at the corresponding group output. A blue stereo fader is provided to control the main stereo mix output, with a button at the top of the strip to activate the balanced insert return. The master module hosts a button at the top to switch in the optional Lundahl LL1517 output transformers, where installed. The monitor control section defaults to reproducing the stereo mix-bus output, but buttons select either of the balanced stereo two-track returns (the first of which can be substituted by a front-panel 3.5mm mini-jack input for a portable media player). There are no facilities to adjust the relative levels of these external inputs. If any of the console’s solo buttons are pressed, the monitoring automatically switches to reproduce the soloed signal(s) with a ‘solo active’ warning light, and the solo level can be adjusted with a rotary control. Facilities are also provided for switching the monitoring to mono, to adjust the monitoring volume, and to dim (-30dB) or mute the signal. The monitoring output can also be despatched to a set of alternative monitor outputs, but there’s no provision for balancing the relative levels of the main and alt speaker outputs. The console’s main output metering above the sub-group modules is derived from the monitor signal path, so it shows the levels of whatever is being monitored, including the two-track returns (if selected) and the soloed signals. I noticed that this meter feed is taken after the mono button, which is unusual but potentially useful. The two high-powered headphone output sockets (a 3.5mm mini-jack on the monitor panel, and a quarter-inch socket under the armrest) are wired in parallel, with a shared volume control which is independent of the speaker monitor volume. Talkback facilities include both an internal electret mic and provision to connect and select an external mic (phantom power is provided). A rotary control sets the talkback level, and buttons despatch the signal to all eight sub-groups and/or all six auxes. Activating talkback to the sub-groups automatically dims the monitors to avoid feedback and aid speech clarity, but not when talking to the auxes. The Trident 88’s line-up oscillator has been omitted. Many of us share a deep-rooted attraction to large mixing consoles that are liberally covered in knobs and buttons, and the Trident 78 doesn’t disappoint — this is a proper old-school analogue multitrack console built to an imposing scale. The construction is solid, elegant, and nicely finished, with a comfortable armrest and smoothly weighted controls that inspire confidence. 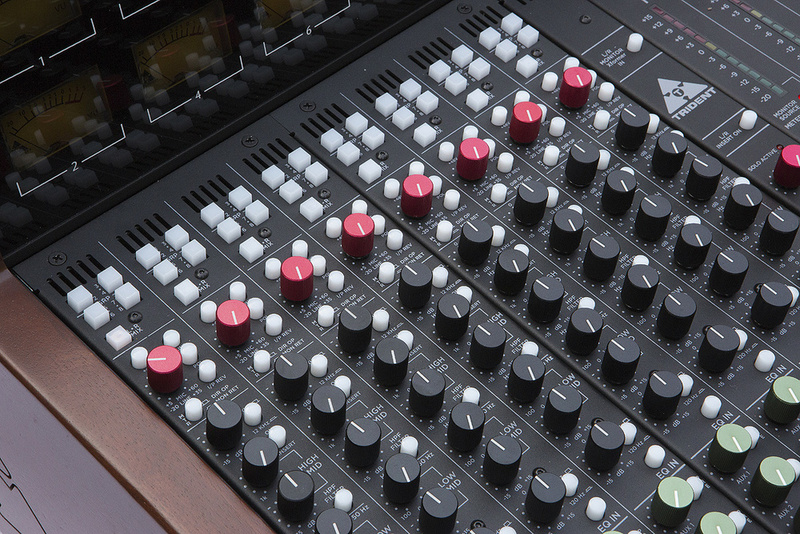 The overall styling pleasantly reflects Trident’s heydays, with those characteristic straight-sided shiny red, green, and black anodised metallic knobs, back-lit VU meters, and lots of illuminated buttons. The control layout is logical and familiar, and the signal paths are straightforward enough that the learning curve is minimal — which can’t be said of many large-format in-line consoles! While the feature set is slimmed down compared with that of the Trident 88 series, the Trident 78s are nonetheless a very capable, high-quality, and versatile consoles and the feature-to-cost ratio has been well judged. 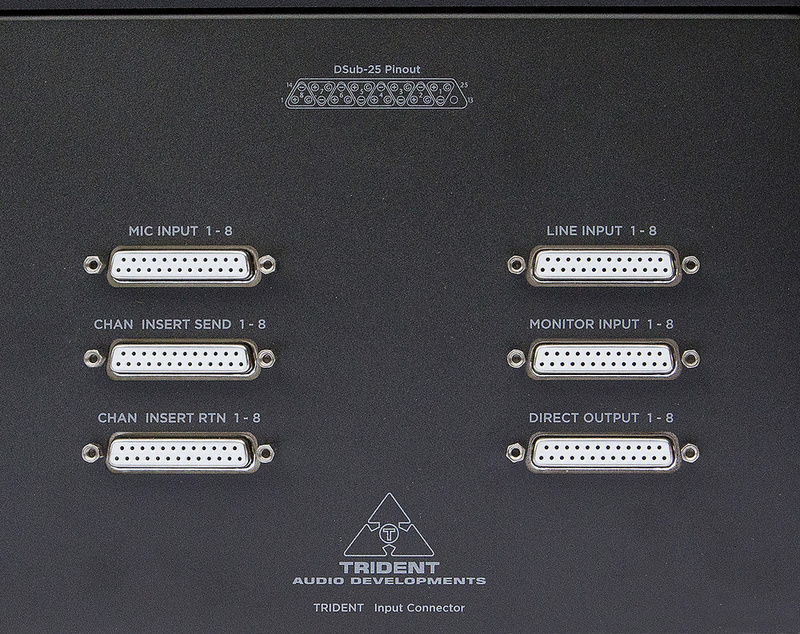 Even the smallest versions of the Trident 78 can accept a lot of inputs for mix-down — a 16 input, eight mono bus model can accommodate 56 mix inputs, with 88 on the 32-channel model. The 32-channel model is the largest currently available, and is pictured here with the more affordable LED meter option. Inevitably, there are a few things I’d have preferred to be done differently, although I’m sure not everyone will share my views. For example, it’s a shame that the high-pass filter travels with the full EQ section when switched to the monitor path; most engineers would like to be able to apply high-pass filtering as they’re recording, but to molest the monitor return with the main EQ as the guide mix is built up. There are work-arounds, of course, but I’d prefer the high-pass filter to be part of the input preamp, rather than the main EQ. Of more concern is the evidence of the design’s ongoing development, such as the redeployment of the optional output transformers from the monitoring to the main outputs, and the re-working of the channel direct-output options (which I feel, as discussed above, still need work). Also, being unable easily to route an effects return into the artist cue aux may well be a cost-saving measure too far for many. There are workarounds, but I found these foibles rather disappointing. On a more positive note, when used conservatively the preamps sound neutral, clean and quiet. But they sound musical and appealing, rather than clinical, and deliberately pushing things harder introduces an attractive thickening before you hit the (very high) overload point. So this is a console that can, if you wish, be ‘played’, to develop a sound character. The EQ is also very easy to use, and allows nice tonal shaping without ever becoming muddy or screechy — it’s the attractive behaviour that has long been associated with Trident-console EQs. While there are obvious advantages to ‘mixing in the box’, mixing on a big analogue console still has its benefits too, and the sheer physicality of it makes it a more enjoyable experience for me. In many ways I think the inherent limitations of ‘manual mixing’ help me focus on the big sound picture, rather than getting lost in minutiae, so I find I arrive at finished mixes quicker. I think they sound better too (although that could be confirmation bias!). There was a time when integrating a large mixer with a DAW was expensive and difficult, but the profusion of audio interfaces with a lot of analogue I/O makes that much easier and than ever before. The Trident 78 consoles have a lot going for them. Despite some practical limitations and a few foibles, they’ll undoubtedly appeal to those who are attracted to old-school recording consoles and manual mixing, but lack the budget for the equivalent 88-series model. Since Allen & Heath retired their GSR24 last year, the only direct competition comes from the similarly priced Audient ASP8024 HE. More money would buy you an equivalent API, or an SSL Matrix hooked up to outboard preamps and EQ. Or, for that matter, a Trident 88.Since Allen & Heath retired their GSR24 last year, there aren’t really any alternatives at this price. The Audient ASP8024 HE is perhaps the nearest competitor, though it’s rather more expensive. More money still would buy you an equivalent API model, or an SSL Matrix hooked up to outboard preamps and EQ. Or, for that matter, a Trident 88. The Trident name stems from a highly influential multitrack recording studio that opened in central London in 1968 and created hits throughout the ’70s for the likes of The Beatles (Hey Jude), Bee Gees, Black Sabbath, Chris de Burgh, David Bowie (Ziggy Stardust), Genesis (Nursery Cryme), Elton John (Candle in the Wind), Queen (all the early albums), Carly Simon, Soft Cell, Supertramp (Crime of the Century), James Taylor, Yes, and countless more. The original owners, the Sheffield brothers, sold the studio in 1981, and it has undergone several major refurbishments and name changes since then. However, it now provides audio post-production facilities under the name Trident Audio Post, and earlier this year a blue plaque was unveiled on the wall outside at 17 St. Annes Court, London, in recognition of the many David Bowie albums recorded there! 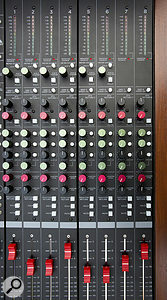 The advent of multitrack recording at the end of the 1960s required far more complex mixing consoles, but there were very few commercial console manufacturers with anything to offer at that time — Cadac, Helios, and Neve had only recently started in the UK, and the control room at Trident was too small for their rather bulky designs. Consequently, the studio’s engineers — including a certain Malcolm Toft, well known for his later console and outboard designs — persuaded the owners that they could build their own bespoke multitrack console. That became the first Trident A-Range in 1971, and it quickly gained a reputation for its sound character (especially its musical EQ which was controlled on sliders instead of knobs). The console’s success inevitably led to build requests from other studios all over the world, and soon this console-building side of the Trident studio’s business was spun off as Trident Audio Developments (TRIAD). After the A-Range, TRIAD came up with a less expensive and ‘scaled down’ B-Range console in 1973, and that was followed in 1979 by the Trident Sound Mixer (TSM) and the Flexmix live sound console. The original Series 80 studio mixer was introduced in 1980, and then the Trimix before the best known and most successful Series 80B in 1983. 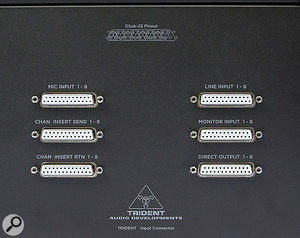 Since then a lot of other Trident consoles have appeared, one of the more notable examples being the digitally controlled analogue Di-An console in 1986. Confusingly, the Trident brand was assigned to a wide variety of consoles and outboard products built by a number of different companies for a while, all asserting direct lineage from the original company, but today the marque is definitively owned by the American PMI Audio Group. The 78-series consoles are available in configurations with different numbers of input channels, and a couple of cost options. Prices exclude VAT. Lundahl output transformer option: $250£192. Impressive preamps with massive headroom. Attractive old-school analogue console layout and styling. Available with as few as eight input channels —or as many as 32. Versatile signal path and configuration options. A lot of mix-down inputs! Choice of LED bar-graphs or VU meters in meter-bridge. No preamp direct out option (yet). High-pass filter travels with main EQ. No aux access or AFL on effects returns. Derived from Trident’s flagship model and retaining the old-school charm and character associated with Tridents of yore, this console strikes a good balance between feature set and cost.